Canal home. 4 bedroom - 2 bath. Enjoy simple living in a simply beautiful setting. Plenty of seating outdoors on the private boat dock, on the house sundecks, or resting in a shaded hammock while you soak in the beach life. 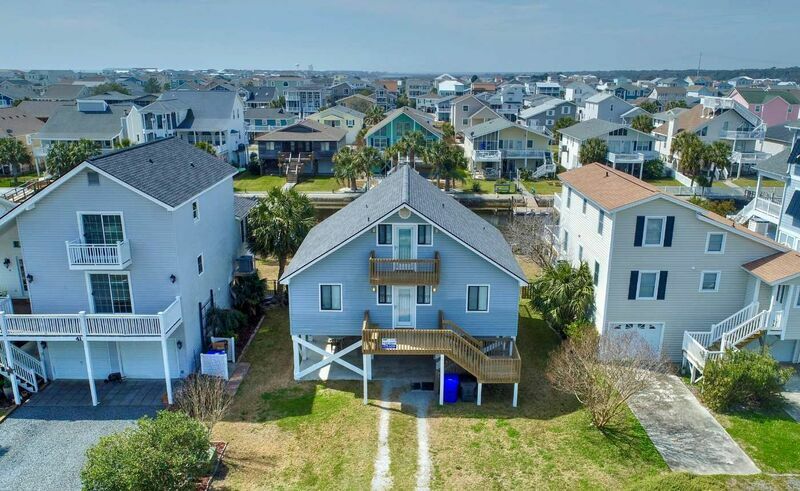 The home is situated on Scotland St with easy access to the Intracoastal Waterway and close to the town center of Ocean Isle Beach, within walking distance to the town attractions. Well maintained. Comfortable, Spacious living area. A great place to relax at the end of day of fishing or water sports. Catch the sunset view from the back deck. Ideal home to rent during VALUE season of Spring or Fall for Boaters, fishing enthusiasts, golfers, and families. Amenities include ceiling fans in living area, 3 televisions, Washer/Dryer, fully equipped kitchen with microwave and dishwasher. Outside hot/cold shower, private dock, 3 sundecks. Newport St, closest beach access. Wireless Internet Access provided. Parking available for 5 or 6 cars. Non-Smoking. Sleeps 12 Bedding: First Floor: Queen, 2 Doubles. Second Floor: Double, Double, plus a Queen sleeper sofa in living area.